There are two very different movies wrapped up in Disney’s new live-action adaptation, Christopher Robin. One is an optimistic family film about a grown man named Christopher Robin (Ewen McGregor) learning to, for the better, think like a kid again. The other is a horror film about abandoned sentient toys who track Christopher down and lure him back into the foggy, ominous Hundred Acre Wood. In this sense, the beady black eyes of honey-loving bear Winnie the Pooh (Jim Cummings) are both abstract enough to be endearing and dead enough to be terrifying. 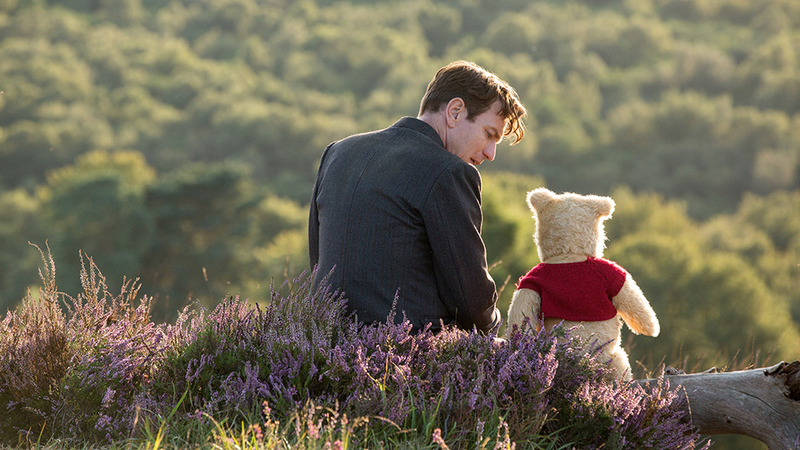 Whichever way you perceive it, Christopher Robin is a film that loses its way in its own offbeat world. Pooh, Eeyore (Brad Garrett), Piglet (Nick Mohammed), and the rest are stuffed animals left behind in the woods by a 10-year-old Christopher. They are dirtied and tattered, old and worn. It has been decades since they have seen Christopher, who comes back in contact with Pooh under coincidental circumstances. One would assume that these animals are only animals in the mind of Christopher. But no, they are truly conscious creatures that anyone can see and hear. While this is fine when an old Christopher is back in the woods traipsing around with his old plush pals, it makes for a strange atmosphere when the creatures surface in downtown London. Part of this is due to a fracturing of tone. In London, everything is dreary. Christopher is an efficiency manager at a luggage company, and if he doesn’t solve the budget problem by the end of the weekend many people are going to lose their jobs. This means that Christopher cannot accompany his wife (Hayley Atwell) and daughter (Bronte Carmichael) on vacation to his old home by the woods, which neither are too happy about. It is a very real economic dilemma: a working class person just trying to provide for his family and getting no recognition for it. But when Christopher is in the woods, the real world is so far away. He begins to forget his dilemma. This disparity in tone is purposeful. It is meant to illustrate the simplistic philosophy of the toys, in which there is no reason to care about problems when living carefree is a choice. As the film reiterates again and again, it is an ideological difference between thinking that nothing comes from nothing or that great somethings come from doing nothing. How the film resolves this ideological dilemma is questionable. The plot ends wrapped up in a nice bow. Lessons are learned. The simplicity of life is realized. But that doesn’t honestly solve the thematic issue. In most other stories, the hard-working person continuing to do hard work is a dignified conclusion. That the lesson is to become a kid again in spite of economic worries doesn’t seem fitting for the times. It probably wouldn’t be fitting for any time. It’s just backwards. With these thematic restraints, the live-action actors are shoe-horned into thankless roles. In particular, Atwell is sidelined as the disapproving wife, whose entire arc involves giving Christopher the cold shoulder. McGregor, too, is given the tough task of being a stern grown up who we are still meant to view as the titular hero. The script tries to do him favors in this regard, giving him moments early on where he sympathizes with Pooh. But these moments are undercut by Christopher’s insistence on shaming Pooh for everything he does. In the first half of the film, McGregor’s character oscillates so widely in his motivations that the pivotal moment where he must decide to either help Pooh or return to work is utterly confounding and unintentionally silly. The voiceover cast fares much better. Cummings and Garrett, in particular, shine in their roles (the other voice actors get sidelined just as Atwell does, unfortunately). There is something so pleasant about Cummings’ drawn out delivery of Pooh’s lines; it never ceases to be charming. And the resigned philosophy of Eeyore, which should be entirely troubling, somehow comes off as humorous time and time again. When the story focuses on the toys and their reunion with Christopher, it is effectively endearing. The middle act, which brings Christopher back and then invites his daughter into the fold, is easily the strongest. When the final third moves the action back into the human world, the seams start coming undone. A lengthy car chase, with toys being flung to and fro, is exhausting in its tediousness. And this leads to the aforementioned climax and resolution, which somehow resolves the conflict too neatly and leaves so much left unresolved. Christopher Robin, re-scored, would make a great horror film. As a delightful family-friendly romp, it is less great. The fuzzy characters doing and saying big-hearted things is all well and good, but it does not remedy the glaring issues in the plot and its messaging.